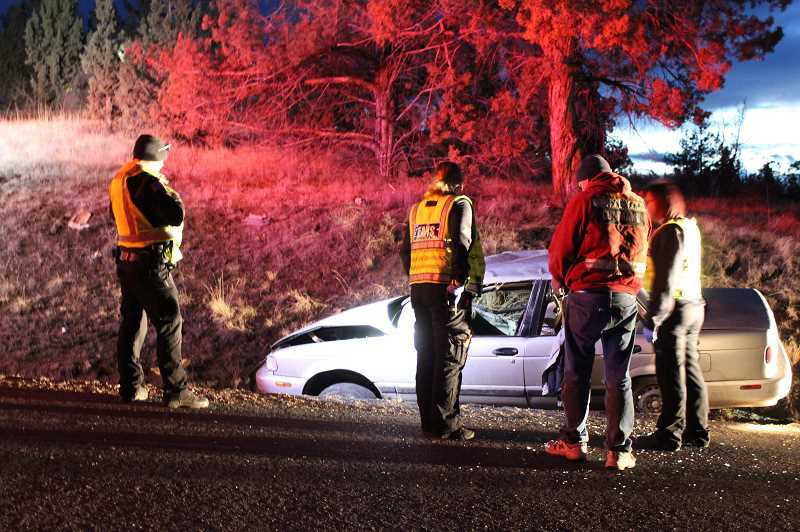 Emergency vehicles respond to accidents on the Warm Springs grade and Loucks Road. A two-vehicle, head-on crash on Dec. 12, was one of several crashes on Jefferson County roads and highways over the past week. Oregon State Police were dispatched to the accident, on U.S. Highway 26, near milepost 107, around 1:23 p.m.
"The crash occurred when a westbound 1999 Ford Taurus crossed the center line into the oncoming lane and struck an eastbound 2005 GMC pickup head-on," said senior trooper Charles Lindberg. The driver of the Ford Taurus, Ramona Rosetta Smith, 45, of Warm Springs, and a passenger in her vehicle were transported by ambulance to St. Charles Madras. Police later contacted Smith at the hospital and issued citations for no operator's license, driving uninsured and failure to drive within a lane. Smith told Lindberg that a spilled drink had caused her to swerve. The driver of the pickup, Marcia Joyce Soliz, 69, of Warm Springs, was also transported by ambulance to St. Charles Madras. The highway was closed in both directions for about 30 minutes while emergency crews removed vehicles and debris. 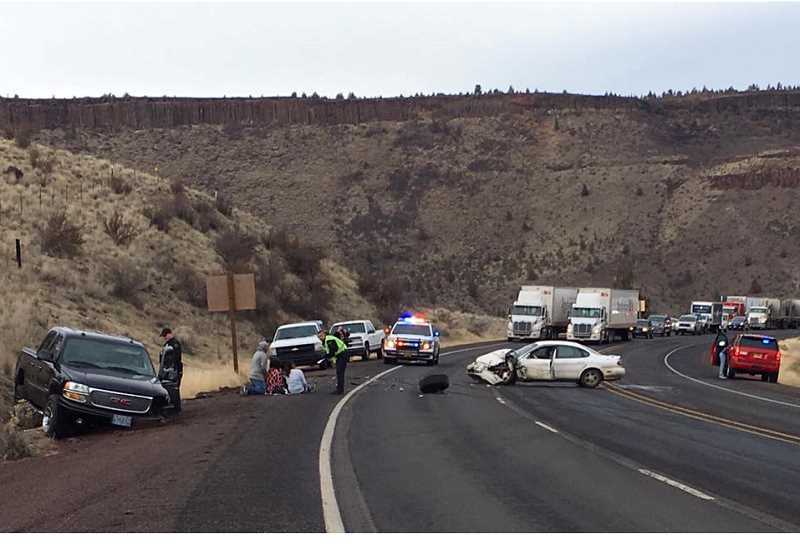 Personnel from the Jefferson County Sheriff's Office, Jefferson County Emergency Medical Services, Jefferson County Fire District, Warm Springs Police Department, Warm Springs Fire and Safety, and Oregon Department of Transportation also assisted at the scene. "It was apparent speed contributed to the cause of the crash," the Jefferson County Sheriff's Office reported, and reminded area residents "to slow down, drive safe, and always wear their seatbelts, especially with the winter weather approaching soon." The Jefferson County Sheriff's Office was dispatched to a single-vehicle accident on Friday, Dec. 14, at 4:50 p.m., on Northeast Loucks Road, east of the cemetery, and found a damaged vehicle off the road, and no driver. After an investigation, Ramiro Alejandro Romero-Juarez, 21, was arrested on a warrant for initiating a false report, reckless driving and reckless endangering. He was lodged in the Jefferson County Correctional Facility.